A restaurant review of one of the hottest Mo:Mo chains in Kumatipati, Lalitpur. “What do you want to eat for lunch today? Do you want to go check out the new Mexican eatery that just opened at Jawalakhel Chowk, or do you want to just go have some Biriyani?” a friend once asks me as the clock was steadily approaching 1 pm. Regardless of what and where we eventually decided to go eat, the question itself really got me thinking. Kathmandu, and especially Lalitpur, has slowly been gathering a reputation as the go-to place for foodies. As someone who has been working in Jawlakhel for the past three years, I can confidently say that exploring these streets on a hungry stomach has always been an experience. Nestled amidst the numerous restaurants, and clothes & auto showrooms that plaster the Kumaripari -Mahalaxmisthan Road, Sinka is the collective brainchild of three young individuals ‑‑ Subekshya Hada, Paras Shrestha and Saurav Sah. 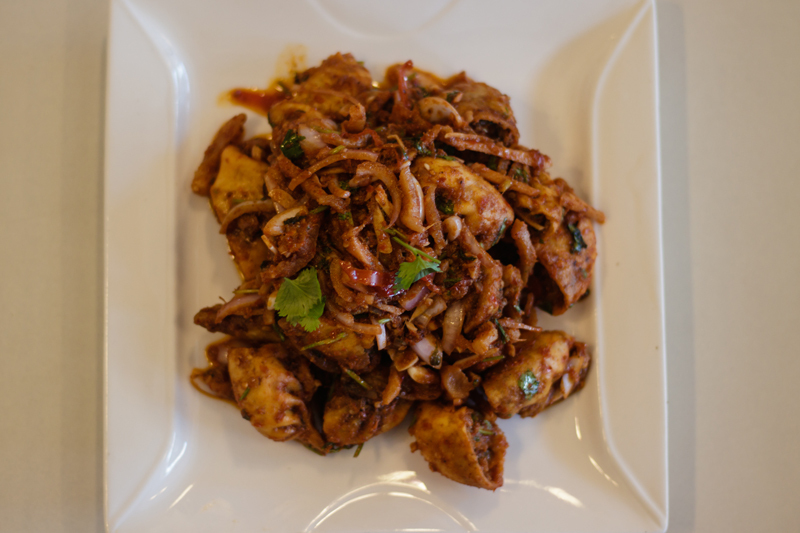 They were friends from college who decided to venture into an entrepreneurial journey with a vision to make the Nepalese dish of Mo:Mos renowned brand. The restaurant is located just within the road beside the UFO Clothing Complex at Kumaripati. Although easy to miss at first, once you’ve managed to find the place, it’ll be hard for you to go anywhere else in the future. Sinka is a relatively small but cozy restaurant. The glass entrance ensures that the dining area is illuminated by the natural light throughout the day. If that’s not enough, the warm smiles of the ever hospitable staff add to its overall charm. The decor is bright and simple and really brings out the aesthetic beauty of the dishes, though beauty isn’t the only aspect bringing hoards of people to this restaurant. During my visit, Sinka was almost filled to the brim with seemingly happy customers. After a short conversation with one of the owners, I was served two trays with four different dishes in front of me. I started with what looked like a plate of four massive chicken wings. As I started eating it, I realized that the insides of the wings were actually stuffed with spiced minced meat within the muscles where the bones would have been. I was pleasantly surprised by just how juicy and delicious it was. Although a bit too spicy for my taste, I clearly understood why this “Wings Mo:Mo” was one of Sinkas’ top attractions. With a glass of chilled mint refresher by my side, I then tried the second dish - the Tikka Mo:Mo. 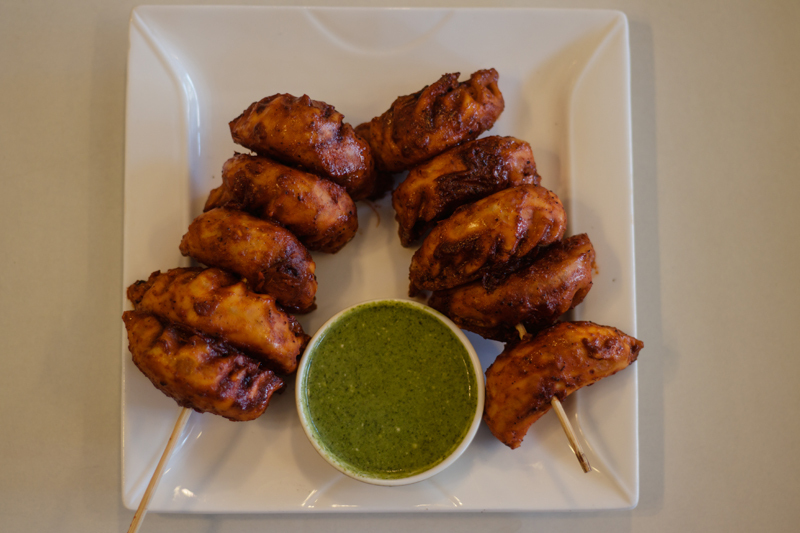 As the name implies, these Mo:Mos were prepared by first dipping them in Tikka gravy and then frying them in a pan. This dish, like the one before it, was also a little too spicy for me but delicious nonetheless. Next up, I tried the Sadheko Mo:Mo ‑‑ Mo:Mos that were marinated in tangy-spicy gravy sauce. It was around this time that my tongue started getting numb from all the spices I had just consumed. I tried a couple and really liked it. It tasted exactly how I thought it would taste. Lastly, I tried the Chaat Mo:Mo. I was both looking and not looking forward to trying it. I had never liked Chaat, but at the same time, I had never thought that I’d actually get to try two different dishes from the two extremes of my food preference spectrum, combined into one dish. Although hesitant at first, I enjoyed the balance between the sweet and sour of the chaat sauce with the spiciness of the Mo:Mos. All the dishes were prepared perfectly and the bright colors of the unconventional ingredients scattered all throughout the dishes made it a feast for the eyes as well as the stomach. The servings were appropriate for a proper meal and the rates were pretty cheap compared to other restaurants around the area. All the dishes were priced at under Rs. 400, the most expensive being the Wings and Sukuti Mo:Mos at Rs.350. Although Sinka is doing well all by itself, the 15 varieties of delicious Mo:Mos and various noodles, wraps, snacks, and desserts are just too good to not be publicized to the masses. Since its establishment on the 5th of February, 2017, Sinka has only gotten bigger and better. Plans to establish a new outlet at Kamladi is already in the works. You can even order the dishes from apps like Foodmandu and Bhoj. The restaurant also invents new dishes every three months to keep the menu fresh and exciting. There is no doubt that Sinka is on its way to becoming one of the hottest food chains in town.